Studied Kinesiology at the University of Waterloo (the world’s first Kinesiology program) which included anatomy, physiology and biomechanics. This was my first in depth exposure to biomechanics – forces, vectors, moment arms, material properties of tissues etc., under the guidance of the now famous Dr. Stu McGill. Studied at the National College of Chiropractic in Illinois. More formal studies in anatomy, physiology and biomechanics. Unfortunately, there are misconceptions about the education of chiropractors, but multiple sources report chiropractic schools actually require significantly more education in anatomy, physiology and neurology than medical or PT school. I have also attended Chi Running and Pose Method workshops, although I don’t advocate either (or any) particular technique. I am not a fan of a “one size fits all” approach. 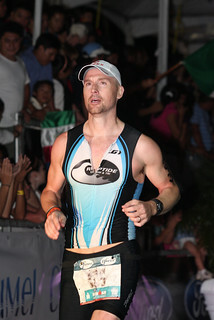 In 2009, I was brought on board the Rev3 triathlon series to be the ART (Active Release Techniques) director. The overwhelmingly consistent thing I hear from both the pros and age group athletes is the same I hear from new patients in my clinic: Whatever pain they are suffering from goes away with rest or treatment, but then comes back when they return to running. That statement indicates that they are running in a way that is putting too much strain on the spot that keeps hurting. No amount of ART, massage, cold laser, injections or foam rolling will help it if the underlying biomechanics aren’t addressed. Unfortunately, I don’t have the time at these races to do a gait analysis. However, I have recognized the need for these injured runners to have access to a proper gait analysis. This lead to…Running Reform.